Woah! September seriously went by in a blur that I realized that I didn't even blog once...other than to post the August Obsessions list...which was late...as is this one. But let's not dwell on that. September was MUCH busier than anticipated and sadly not as much sewing was being accomplished as I had hoped. I thought that since the Munchkin was starting Kindergarten I would have more time than usual to dedicate to project bag production. Um...not so much the case here. My kiddo has special needs and that required me to spend a little more time at the school than originally thought to help get him transition and get going. The school day isn't as long as it appears to be because just when I start to get into a sewing groove it's already time to go back to the school to pick the kiddo up! Ok. End of rant. Back to September. So anyhoo, my brain was constantly focused on school and trying to establish a new routine - for both the Munchkin and myself. It's been slow going, especially with all the major changes going on. I'll admit, sometimes I miss the simplicity of preschool. Everything was so, so easy and predictable. Oh well, that's how it goes I suppose. So since my brain was preoccupied with so many new beginnings, I rarely had time to think of much else, let alone anything knitty related! Hmm...maybe that's why I've been feeling so out of sorts lately? Knitting is when I can sit, relax, and escape...enjoy a cup of tea, get lost in my stitches, and let my mind have a break. Since I wasn't knitting, my mind was going at full tilt. Hmm... Note to self: MUST knit more! I don't know if it's the cool, crisp air or the grey, blustery days but I've been having some serious cravings for cables. Whether it's wearing them or knitting them up, I just want cables! Something about them also screams fall. And I think I'm not the only one, judging from all the patterns that were being released throughout September quite a handful of designers had cables on their brains too. I'm just dying to get some cable action going on my needles but I think it might have to wait until project bag production dies down a bit. I'm envisioning cables on giant, fluffy cowls, along fingerless mitts and socks, adorning cardigans and pullovers, and even on shawls...like the recently released Mixed Stories shawl by the incredibly talented Joji Locatelli. Is anyone knitting up cables galore? Please share, so that I can live vicariously through you! Lately I've been thinking a lot about natural fibres that aren't from sheep. Like cashmere, silk, possum, yak, and I'll admit, hemp. Maybe it's because I bought a ton of 100% hemp yarn when I was visiting my family over the summer? Maybe it's because I've got 2 skeins of insanely luxurious 100% cashmere that I've been dying to knit with for the last few years? Maybe it's because I'm determined to get the Munchkin to wear something hand knit by Mommy (I discovered previous knits were too scratchy for his sensitive skin) and that non-sheepy fibres might be key? Or maybe it's just a reason for me to purchase more yarn to add to the stash?? Ok, don't answer that. We all know it's because of the latter. But let's not dwell on that. I started getting interested in different natural fibres after swatching for a few design ideas that I've had floating around my head for the past several months and not getting the drape and fabric that I was looking for. After much perusing of the internets and visits to my LYS, I decided that maybe I should try a different fibre all together. Whenever I get a break from Munchkin life, sewing, and fabric cutting, I try to swatch a little with a new fibre. 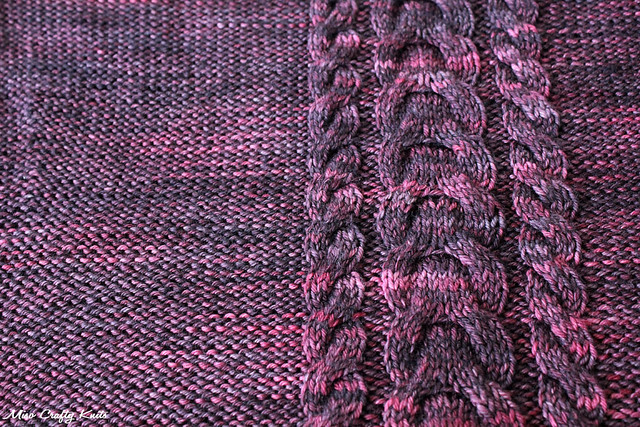 Who knew swatching could be so much fun? And who knew I would ever say that out loud? Recently I was sent the beautiful skein of 100% yak yarn (photo above) from Bijou Basin Ranch, who specializes in yak fibres. I've never handled or even seen yak yarn before, as there isn't anything like this in any of my LYS. 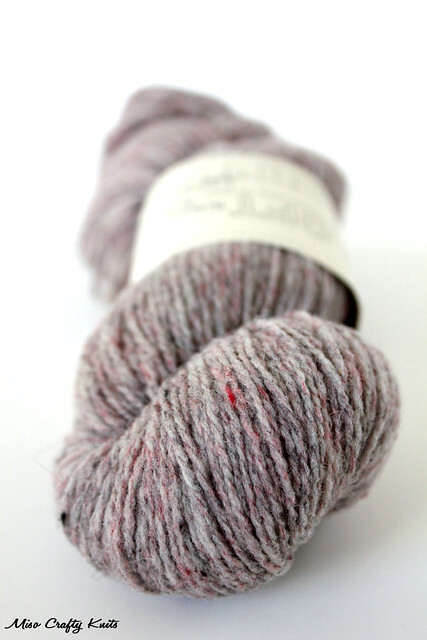 So to get this lovely skein in the post was pure meta (to me, that is). I didn't know what to expect. It looks a bit rustic but it's SO soft. The colour is bold but has a tweedy sense to it. I can't wait to knit it up!! Thank you Bijou Basin Ranch!! I'm also eyeing up their Bijou Bliss yak/cormo blend...talk about luxury! Ok, ok...I've just got yarn on the brain. As if you don't too! So what's up with the rustic yarn? Well, for some reason when I think of cables I think of rustic yarn. Probably because rustic yarns are "stickier" than the usual superwash yarns that I tend to use. But there's just something about rustic wool and cables that just oozes "comfy cozy warmth". Especially on those cold-to-the-bone days. After scanning the stash I realized that I have a fair amount of rustic skeins that are just begging to be knit up. From Brooklyn Tweed Shelter to Cascade Eco Wool to the lovely Finnish gifted to me from my fabulous friend Liisa (the yarn is Ohut Pirkkalanka, in case you needed to know), they are all currently vying for my attention. Soon, my pretties. Soon. When Mama has more time on her hands! Then you will all have your chance to dance on my needles! I. LOVE. This. Stuff. Period. Eons ago I was given a little sampler bottle of Best Press in the Lavender Fields scent, back when I was still in the fashion industry, wasn't a knitter, and wasn't fond of anything lavender. And to tell you the truth, I wasn't much into the pressing of linens or dress shirts. So I really had no desire to use or the need for the stuff. Eventually after several moves the bottle got tossed out. Fast forward to the months leading up to the Munchkin's birth when I was doing a fair amount of sewing - when I used to curse at having to pre-wash all my fabrics, mutter foul language at the deep wrinkles in those washed fabrics, and cuss out the aerosol cans of spray starch that did nothing but clog and guck up my iron. I forget how I came across it again, or how I acquired another bottle but I managed to get my hands on some more Best Press. I think I used it once before the Munchkin arrived. In the time from when I had the Munchkin up to a few weeks ago, that bottle of Best Press lived in a box full of crap (the box literally said "box of crap"...it was stuff I didn't have a home for, didn't really - if at all, used but didn't have the heart to chuck out). I finally went through the box in a crazed state of "I've got to purge the house a bit before I end up on an episode of Hoarders", and once again crossed paths with this so-called starch alternative. I gave it a go one day after fighting the flimsiest quilting cotton known to man and fell completely in love with the spray. Why in the world did I ignore this stuff?? Better yet, how in the world did I sew without it?? 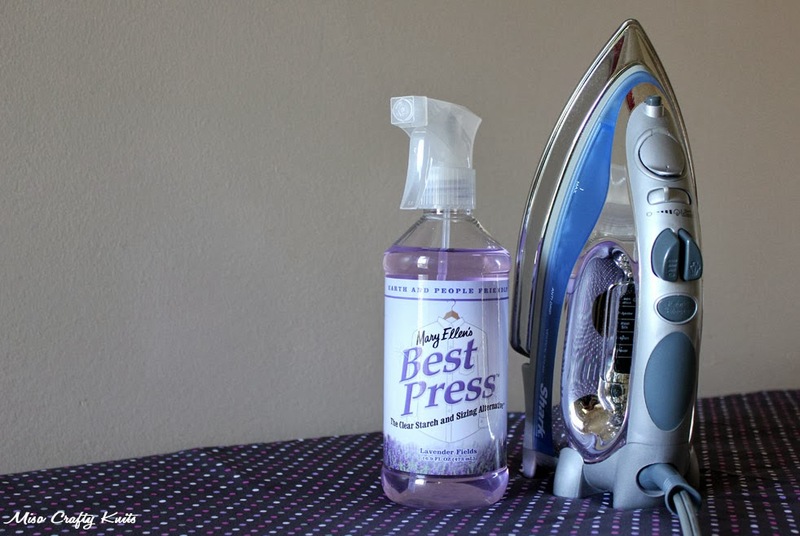 Not only does it smell nice (and not at all in an overly powerful way) but Best Press gets out the most stubborn of wrinkles and doesn't clog, muck up, or leave weird spots all over your fabric. And bonus: it stabilizes your fabric beautifully and it acts as a stain guard to protect your fabric. Um, that's awesome in a bottle right there! No more having to waste time trying to fuse small areas of fabric to gain sewing stability, no more struggling with persistent and annoying wrinkles and then trying to cut around them, no more bypassing certain fabrics because they're a little on the flimsy side...Best Press, you've saved me time and my sanity! It makes me want to start quilting that feathers quilt block quilt that I've been daydreaming about since May, or the several Donut quilts that I've been thinking about making for the whole family...man, what do they put in this stuff?? I ain't got no time to be doing any selfish sewing! How can you not like a sweater that's named Double Rainbow? 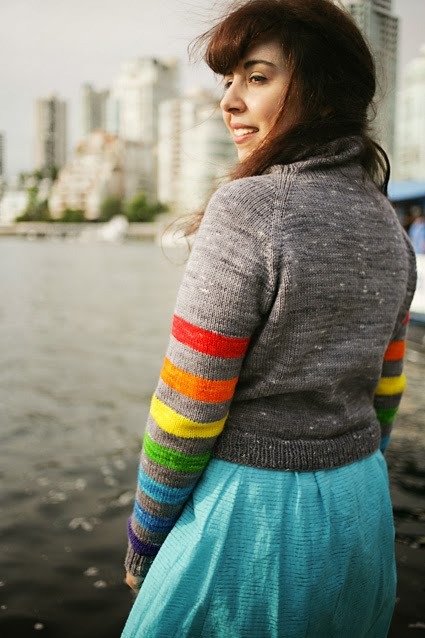 How can you not smile when you see those whimsical rainbow hued stripes running up the sleeves? How, I ask you, how?? It's just crazy talk!! You might as well not like fluffy kittens and cozy warm beds while you're at it. Crazy!! But back to the pullover. When I first spotted this rainbow gem on the new Knitty Deep Fall 2013 issue, I knew that not only did this pattern have to go to the top of my queue but that I will HAVE to knit it up before the year is over. I mean, what a perfect sweater to have in your wardrobe for when you need some colour and some cheering up on those dreary winter days! It's a must-have for sure! Well, there you have it. The little things that I thought about in between all "the big stuff" all throughout September. I'm going to put it out there right now that blog posts *might* be a little nonexistent this month, as I deal with my (currently dead) sewing machine (let's not get into that, lest you want me to break down and cry) and try to prepare for Knit City. But I can promise you, once Knit City is over, the activity on this blog will be back to it's usual bubbling self! And hopefully by then the twitch in my eye will also go away. Fingers crossed. 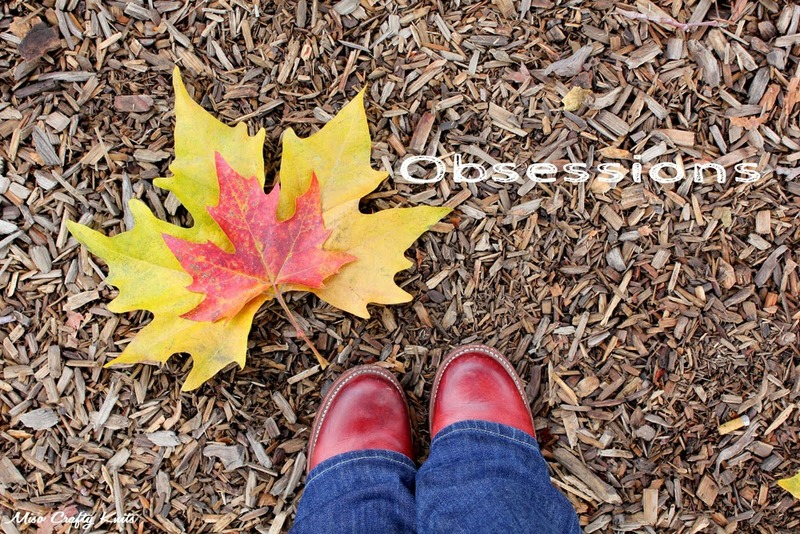 So what have you got planned for the fall? Or for Halloween? Let me know, I'm going to need to find ways to give my poor ol' brain a break from time to time this month! !